Amazon has been building AI enabled products for more than 20 years. This experience is transferred to AWS’ customers in the form of tools, specialized resources, and processes. In this talk, we discuss an overview of Amazon AI’s strategy, products and services for an overall AI democratization. Attendees will get insights into how Amazon uses AI, what are the products and services available for AWS’ customers, how do these products roll up to intelligent systems’ use cases, what are best practices and lessons learned over years of scaling AI systems, and how AWS pioneers modern AI paradigms in the era of Cloud Computing. 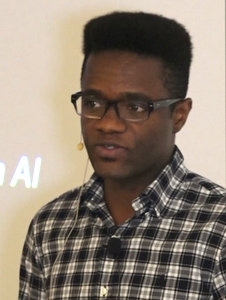 Dan Romuald Mbanga is a Business Development Management Lead for AWS AI platforms. Dan leads strategic business development initiatives for Machine Learning and Deep Learning Engines, helping customers realize the potential of intelligent systems, and build AI solutions at scale on AWS. Prior to this, Dan joined AWS in 2013 as a Big Data and Devops Manager where he built two teams of specialists on the Hadoop ecosystem, and CI/CD technologies. Dan holds a BSc in Physics and Computer Science, and has over 12 years of experience in Engineering management. "You can't do data science in a GUI"